A growing crowd of Central American migrants in southern Mexico resumed its advance toward the U.S. border on Sunday. The numbers have overwhelmed Mexican officials’ attempts to stop them at the border. 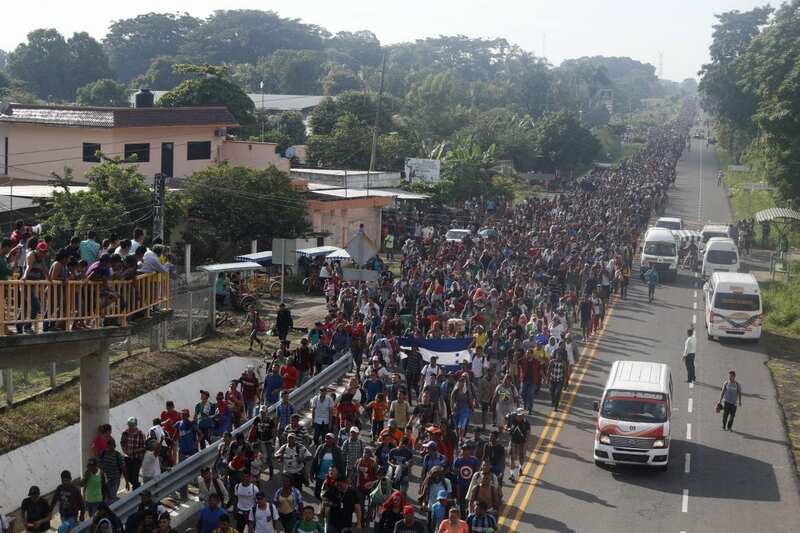 The Associated Press reports that the number of migrants has swelled to about 5,000, but an official in Mexico has put the number as high as 7,000. With the November midterms less than three weeks away, Trump has become more vocal about the mass migration. Reporter James Fredrick was in southern Mexico and spoke to NPR’s Lulu Garcia-Navarro on Sunday. He observed officials stopping migrants from crossing the bridge that stretches over the Suchiate River, which is the legal crossing between Guatemala and Mexico. Mexican Federal Police, however, did not stop those migrants who crossed the river by swimming or using rafts. Several hundred migrants already had applied for refugee status in Mexico and an estimated 1,500 were still on the Guatemalan side, hoping to enter legally. It has not been clear where the additional travelers had gathered from, since about 2,000 had been gathered on the Mexican side on Saturday night. The number, however, may be misconstrued since people have been joining and leaving the caravan daily. Many of these migrants are fleeing poverty and violence. James tells NPR that people at the border say they’ll do whatever is asked of them, as long as they aren’t sent back to Honduras. The decision to form a migrant caravan came after some migrants gave up trying to enter Mexico legally because the asylum application process was too slow and most consider their final destination to be the U.S., where Trump says he will close the border on them. “They’re not coming into this country,” Trump said at the rally. Samuel, a 40-year-old Honduran traveling with his wife and three sons, tells James that he hopes Trump will change his mind. “I believe Trump’s heart may still be tender and one day he will feel peace and happiness and do good for us. He won’t regret it,” Samuel said.